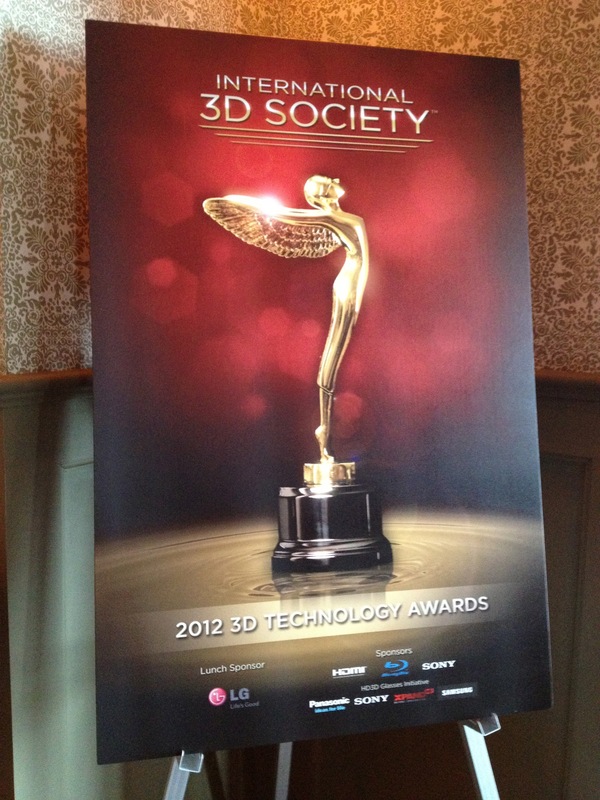 I had the great pleasure and privilege of attending the International 3D Society’s 2012 Technology Awards January 15. It was a pleasure because there was a great venue, great luncheon, and it was a truly fun event. I was privileged to be in the company of pioneers, brainiacs, and fellow enthusiasts. All of the winners are doing very interesting things—I want to take this opportunity to highlight some of the extraordinary work being done behind the scenes in this industry to ensure high quality, flexibility, and the best possible enduser experience. The awards went to the following—in alphabetical order—for the achievement indicated. Click on highlighted items for links to more information about each particular company and award-winning technology. Blu-ray Disc Association – “Blu-ray 3D Specification” This how we get 3D into your living room! Corey Bridges accepting on behalf of Cameron-Pace. Cameron/Pace Group – “Shadow D Technology and the Shadow D System” High-end, professional gear based on the genius idea of shooting 2D and 3D simultaneously on the same rig to make life easier for content producers everywhere (think sports). Fuji – “Fujifilm Finepix Real 3D W3 Digital Camera” An affordable, consumer 3D camcorder. This brings 3D into the world of home video, and also serves as an entry-level 3D camera for budding auteurs. Full HD 3D Glasses Initiative – “FHD3DGI Standard” so there is a consistent standard across manufacturers of active shutter glasses. This is good (and I have a closet full of proprietary chargers to prove it). Kudos to Panasonic, Samsung, Sony, and XPAND. GoPro – “3D Hero System” A nifty kit that puts together two Hero HD cameras into a (relatively inexpensive) rig to shoot 3D (and 2D). HDMI Licensing, LLC – “Standardization of 3D Formats over the HDMI Interface. Specification Version 1.4a” If you are reading this blog you’ve probably seen High-Definition Multimedia Interface® (HDMI) interface and cables. Again, this is a standard that, when strictly adhered to, assures maximum interoperability between different manufacturers and their products. 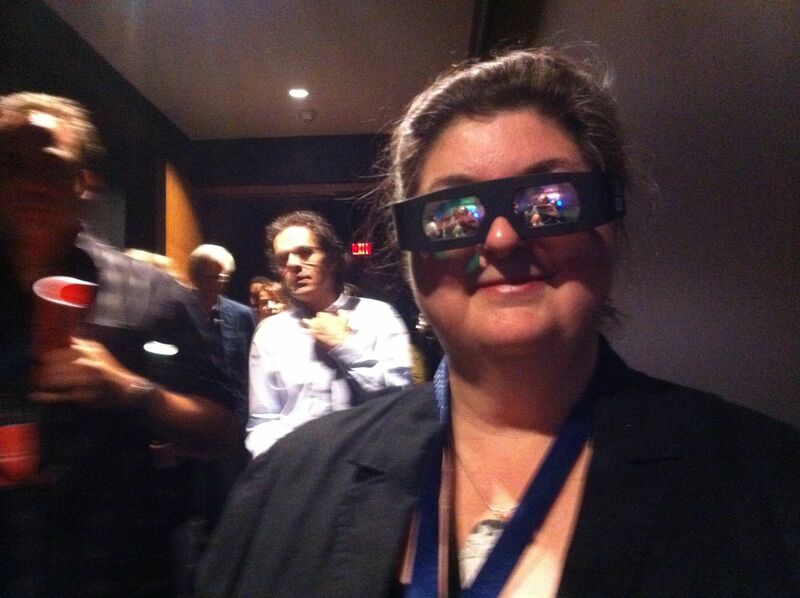 This spec addresses issues particular to 3D so it’s an enabler. LG Electronics – “LG Cinema 3D TV” State-of-the-art 3D television set. Panasonic – “AG-3DA1 Twin Lens 3D Camera Recorder” A high quality 3D camera in a compact form factor. This is important because getting two lenses close enough together is a huge challenge. Cumbersome camera equipment has been one of the biggest barriers on the content side. This is important progress. Peter Wimmer – “Stereoscopic Player” Peter’s company 3DTV.at (from Austria) makes a well-regarded, solid, reliable software player for 3D content on PCs. Silicon Imaging – “SI-3D Stereo Digital Cinema Camera System” is a 3D digital camera system that has an integrated stereo visualization system that enables immediate (no special processing) playback and editing capabilities using some neat visualization tools. 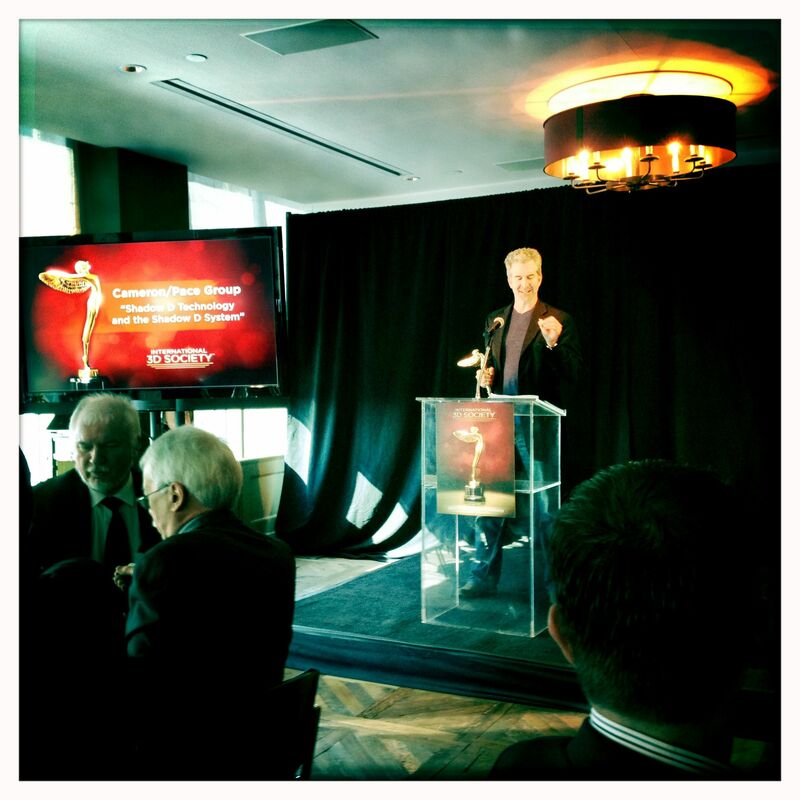 Buzz Hays from Sony accepting award. Sony – “HDR-TD10 3D Handycam Camcorder” It’s a camcorder, an HD camcorder, a 3D HD camcorder. Let that sink in for a minute! Sony – “Playstation 3” Maybe you’ve heard of it? We’ll forgive them for erroneous warnings implying it’s dangerous for young kids (it’s not) because they are getting 3D into more hands. Vizio – “Theater 3D” Big, beautiful 3D television with affordable (passive) glasses. YouTube – “3D Channel” In a few short years YouTube has changed the way the world consumes video. The YouTube 3D channel is another potential game-changer. Society President Jim Chabin talking about the "Make it 3D" campaign. These are exciting and interesting times. 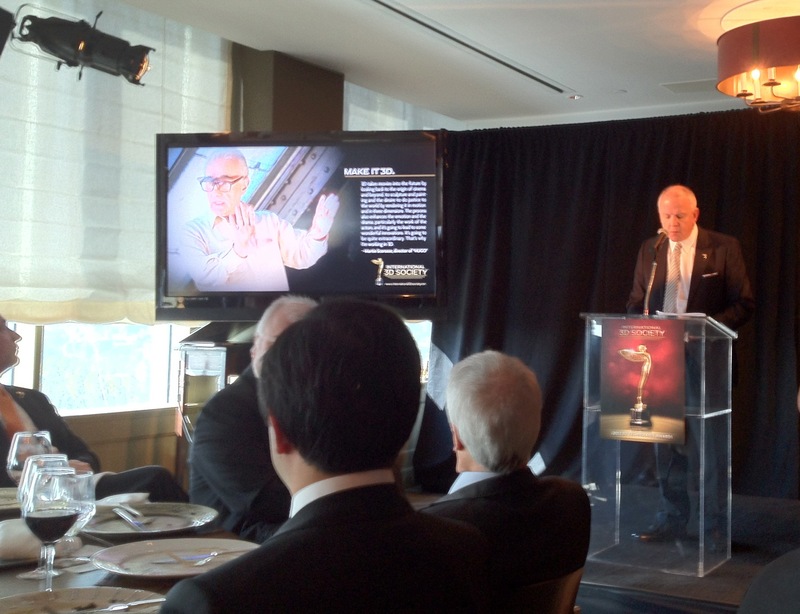 Congratulations to the International 3D Society and all of the honorees.